A myriad of cuts and bevels brings out the brilliant color of this jade crystal Regal Diamond award. A truly dramatic statement to reward success and achievement. Pure K9 premium optic crystal award. A modern interpretation of a sail boat. The Regatta Award resembles a sail that is completely expanded. This award is subtle in design and offers lots of space for a personalized message. Pure K9 premium optic crystal award. Engraving can be done on the clear panel as well as on the red base. Available in two sizes. Success is achieved through perseverance. Behind every success story is a sound decision maker who did not waiver during times of adversity. Present these individuals with the Resolute Award for remaining focused on success. 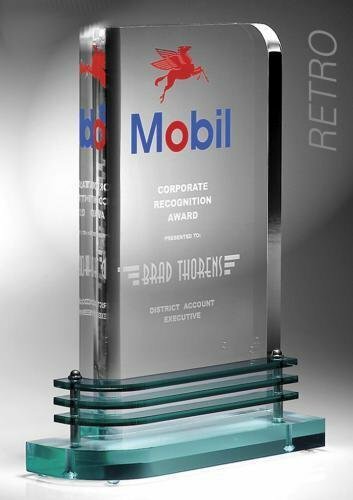 Take the time machine back to the 1950's with this retro style acrylic award. 11" Tall and 1' thick, this acrylic award lasers to a frost white text color. Image shown with full color imprinting, available as an optional imprinting method to this acrylic award.